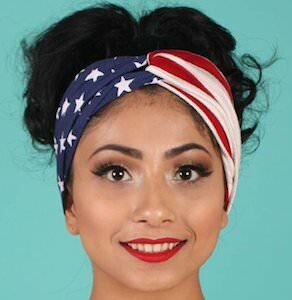 If you want your hair to look perfect for the 4th of July or any other day of the year then you just need to get this US flag headband. The stretch headband has a knot in the front which makes it look really cool and from the knot, one side is blue with white stars and the other side is red and white striped and together they look a lot like the Stars And Stripes flag of the USA. Now your hair will be ready to party and I am sure you will love having this headband as it just looks amazing.